I had to laugh when I read the back cover, though I wholeheartedly agree with the sentence I've highlighted. When a favorite aunt is reading to her favorite nephew (and she has her arm around him) she can read Shakespeare's sonnets or Milton's epic verse or T.S. eliot's Wasteland and still hold - if not the child's attention, as the leas the child himself. In the classroom, as every teacher knows, it's different. 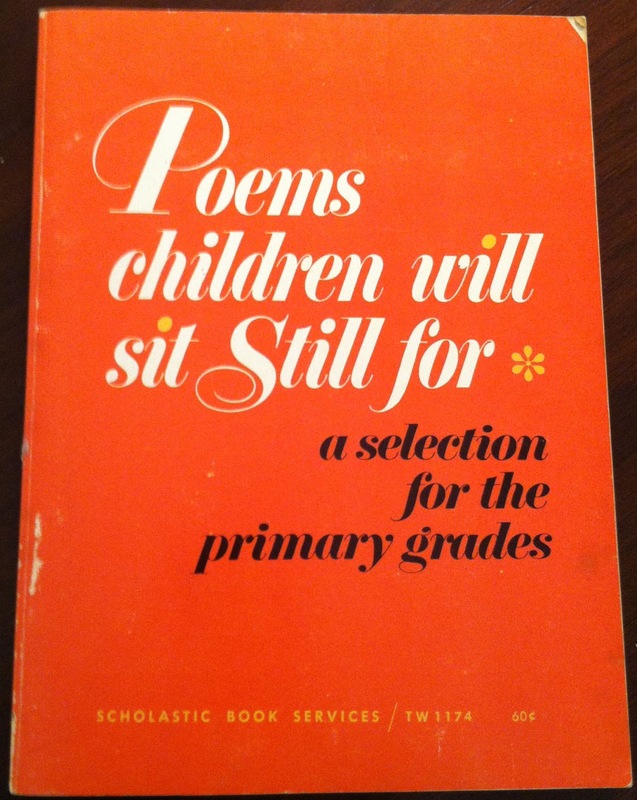 Each of the 106 poems in this this book was chosen with this difference in mind. They were chosen expressly for a teacher to read aloud to—and with—her class. Every selection invites the listeners' participation—vocal, physical, or emotional. The selections cover an extensive range of primary-grade children's interests and experiences. There is plenty of nonsense and humor, and there are some sad poems too. For many of the poems, we have offered a few suggestions for reading, of for audience participation, or for possible discussion. But it is well to remember that a poem doesn't have to lead to discussion , or art activities, or anything at all. A poem can simply be enjoyed for its own sake. We hope this little book will help you transmit to your boys and girls the joy of poetry. This text is actually excerpted from the introduction to the book. There are a few additional sentences, some of them about how to actually read a poem. But I thought this one was most interesting. When I read a poem and at first glance (or listen) don't like it, I actually re-read it, multiple times. I want to know what doesn't work for me. Why don't I like it? It becomes a puzzle I need to figure out. Is it the rhyme? Or meter? Is it the subject? This book is divided into the sections (1) Fun With Rhymes; (2) Mostly Weather; (3) Spooky Poems; (4) Story Time; (5) Mostly Animals; (6) Mostly People; (7) Seeing, Feeling, Thinking; (8) In a Few Words; (9) Mostly Nonsense; and (10) Numbers and Letters. I will admit I found it odd the Frost's poem Stopping By Woods On a Snowy Evening was in the Spooky poems sections! 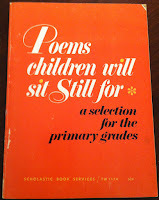 I suppose I decided I needed this one because it contained Sanburg's Arithmetic, as well as poems by Mary Ann Hoberman, Karla Kuskin, John Ciardi, Eve Merriam, Myra Cohn Livingston, and others. Today I'm sharing two poems in this book by Karla Kuskin, from the sections Spooky Poems and Mostly Nonsense. But nothing really came out right. Not sure these are worth sitting still for, but I enjoyed them. I'm working on an ekphrastic poem and have been playing around with a number of different forms as I write to the image. Right now I'm playing with the tritina. Here are the nuts and bolts of the form. You can read more about the tritina at Poetic Asides. So, the challenge for the week is to write a tritina. Won't you join me? Please share a link to your poem or the poem itself in the comments. If orange is the new black, than Tuesday is the new Monday. My apologies for posting late. Here is this week's challenge. Deibhidhe Guilbnech Dialtach is an Irish verse form written in quatrains. Here are the requirements. You can read more about this form at Poetry Magnum Opus. I hope you'll join me this week in writing this variation of the Deibhidhe. Please share a link to your poem or the poem itself in the comments. Forgive me for being a day late. I leave for a conference on Wednesday and I'm a bit at loose ends right now. The bop is a form invented by poet Afaa Michael Weaver. Here are the requirements. You can read more about this form at poets.org and Robert Lee Brewer's Poetic Asides. I hope you'll join me this week in writing a bop. Please share a link to your poem or the poem itself in the comments. This month my poetry sisters and I tackled the etheree. An etheree is a poem of ten lines in which each line contains one more syllable than the last. Beginning with one syllable and ending with ten, this unrhymed form is named for its creator, 20th century American poet Etheree Taylor Armstrong. I made the etheree the first poetry stretch for the month of September. I did this to avoid procrastination and to encourage myself to write early. How did I do? Terribly! I was still writing and rewriting in the wee hours before this post was scheduled to go live, in the hopes that something good would come out of the bits and pieces I was tinkering with. Early in the month the theme of relationships was bandied about, and that's when I really got stuck. It seemed to me that relationships required two poems, or at least a conversation. Alas, I couldn't seem to make this one work. As I prepare this post I am reminded that we promised ourselves to write and share REGARDLESS of the state of the poems, knowing that much of the time they won't be perfect. That means today I am embracing imperfection and sharing the most polished pieces of the lot. but our human loves me most! look and see! No one can resist a cat. look and see! No one can resist a dog. I also wrote numerous poems about my dog. I like this one best, as it's a true story. who will save her. They rescue each other. You can read the etherees written by my Poetry Seven compatriots at the links below.